At some point we’ve all found ourselves cleaning doggy dirt off our shoes. While most dog owners are responsible and make the effort to clean up after man’s best friend, the minority who don’t can foul things up for the rest of us. A recent survey by Dublin City Council asked dog owners if they cleaned up after their pet in public and as many as 40% of those questioned admitted to ignoring the mess created by their animals. 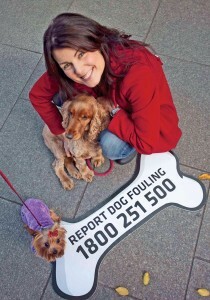 The new hotline number for dog fouling complaints is 1800 251 500. Pictured above: Tara Flynn with her dog Oscar.